2016 has been dubbed “The Year of Audience Targeting in PPC” by Acquisio, and with good reason. Up until recently, PPC advertisers have had two weapons in their arsenal: search and social. Search is, by definition, an expression of intent: users are telling you exactly what they’re looking for. When search advertisers choose the right keywords, they usually get great results from search. The problem with search, though, is two-fold. You don’t know anything about the searcher aside from what they searched for. They could be a potential customer, someone looking for a job, or a kid doing research for a high school paper. Also, the search universe is finite: it’s limited to people actively searching. Social, on the other hand, has great reach. People are on social media all day long, talking about a variety of topics. And we tell the social sites everything about ourselves: where we work, what we like, whether we’re married with kids, etc. It’s easy to get pinpoint audience targeting with social. What’s missing is the intent – we have no idea whether our audience is in the market for our products and services. Remarketing emerged over the past few years as an answer to the dilemmas posed by search and social PPC. We already know something about the people who visited our website. If they came from social, we know a lot about them. Layering that audience information on top of search data is powerful. So how do you get started with audience targeting? Put remarketing codes on your website. Most PPC platforms now have a remarketing tag. Install the tags for the platforms you’re using: Google remarketing is done through Google Analytics, although there is also a native Adwords code you can use. Bing Ads uses Universal Event Tracking, or UET. Facebook and Twitter also have tags that can be used to create remarketing audiences. Once the codes are installed on your site, you’ll start to gather data that will be used to create audiences. Every advertiser should create a minimum of two audiences: all website visitors and converted visitors. With remarketing, you can combine audiences to create a custom combination, or you can exclude audiences from targeting (also known as negative audiences). For example, you can create an audience of visitors who did not convert. This is a prime target for remarketing and is the simplest way to get started. Targeting non-converting visitors can be highly effective if you have a simple product or offer. But what if you’re promoting multiple products and services? It probably makes sense to create an audience for each product or landing page, or at least groups of products. • Show the user the product originally viewed, with a discount or time-based offer. Creating urgency is a great way to convince on-the-fence prospects to buy. • Show the user a content asset related to the product or service. For products with long or complicated sales cycles, users often need additional information. Offer that to them via remarketing. For ecommerce advertisers with large product catalogs, Google offers dynamic remarketing, which automatically creates ads based on your product feed. It’s a great way to scale your remarketing efforts. For B2B advertisers, time-based remarketing is often highly effective. You can serve content to users tailored to their buying cycle. Let’s say your buying cycle is 90 days long. You can create 3 audiences with different durations: 30 days, 45 days, and 60 days. For the 45 day audience, exclude the 30 day audience, so you’re only reaching users who’ve been in the market more than 30 days. For the 60 day audience, exclude the 30 and 45 day audience. Each audience can receive content that becomes progressively more urgent in nature, coinciding with the buying cycle. For social PPC, custom audiences can be used in countless different ways. Audiences can be segmented based on demographic data, with content specific to each group. Facebook also has Lookalike Audiences, which algorithmically matches similar users to your custom audience. Lookalike audiences can be a great way to expand your reach to a relevant group. Let 2016 be the year of audience targeting for you by employing these techniques. Melissa Mackey is Search Supervisor at gyro, the largest independent B2B agency in the world. A veteran PPC marketer, she helps clients achieve maximum ROI from paid search. 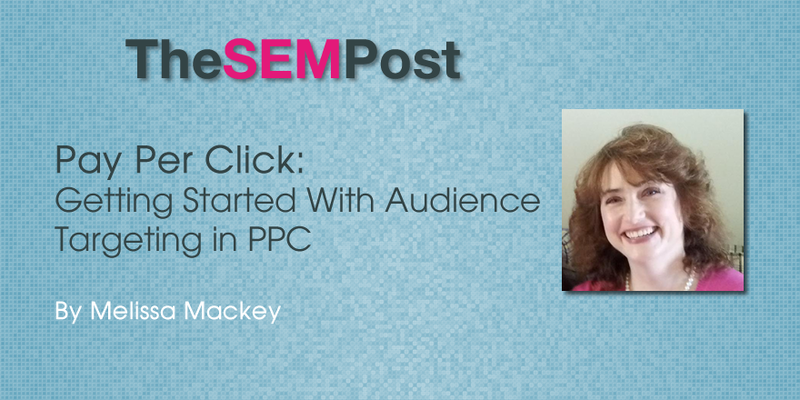 Mackey contributes regularly to Search Engine Watch and Web Marketing Today as a PPC expert author. She also hosts a blog, www.beyondthepaid.com, where she writes on the topics of pay-per-click and search marketing. Mackey speaks regularly at industry conferences such as SMX Advanced, Search Engine Strategies, and PPC Hero’s HeroConf. Throughout her career, her achievements include the evaluation and implementation of paid search campaigns for all types of advertisers, as well as execution and analysis of ad copy and landing page strategy. Mackey holds a Dual BA from Michigan State University, and a Masters of Management from Aquinas College. She lives in East Lansing, Michigan with her husband and two teenaged children.